This essay was written for Simon Streather’s exhibition Night Paintings at The Cello Factory, London (October 2018). Simon Streather’s new paintings look like rare objects, either time-worn watercolours or perhaps old stained documents. Or maybe they are made to evoke fragments of ancient scrolls that can only be shown on parchment paper. Perhaps there is a reference to archives here, I’m not sure. In any case, there is obviously an inherent fragility to them. I see them not reproduced online or in a book, but in a gallery setting, hung on the wall. I note that the paintings have no frame, and yet I also note that the hand-made sheets of papers on which they rest constitute some sort of framing device. There is a frame, but strangely the frame isn’t there. Maybe the walls or the gallery space itself constitute the frame. In any case, the parameters of the frame are unclear. Frameless and fragile-looking, they seem to suggest some kind of poverty of means. The simplicity of ink, water, and pigment, their small size, the restraint in only producing faint traces. They stress economy not only in the sense of thriftiness, but also of prudence and caution. There is no glamour or glitter here. No bold gesture. Everything seems to point to some kind of monastic frugality. I take a long look at them. The more I do, the less I can determine the actual process that led to their creation. Which brush stroke ushered which other brush stroke? Which pigment saturated the field first? At what point did these scratches occur? How did the paper contribute to the making of the painting? I cannot tell. After staring at them for a while, I conclude that although they are handmade, they are also somehow mechanistic. They show the outcome of a kind of repetitive ritual, attempts to keep going again and again without recourse to a machine as such. In any case, they obviously try hard to avoid connoisseurship or the good eye. Although they are highly aestheticized, they nonetheless never fall for a preconceived notion of what water-colours should look like. Some seem indeed abandoned half-way in the process of making them, as if it didn’t matter. I wonder whether they were made in sequences of two or three. Or maybe one at a time? A month’s work? A monk’s labour? The one thing that stands out for me is the fact that most of the paintings appear to include one or more crossings. The brush strokes—some as large as the paper itself—seem to always cross over the paper, marking it with a left-to-right or top-to-bottom crossing. This can mean many things. They can be about crossing out the paper, erasing its whiteness so as to only leave a mark or sets of marks. They can also be about crossing over, both in the sense of marking the passage from one end to another and that of passing over. Or maybe, they can also be made at cross purpose, a kind of misunderstanding, paintings mistakenly made. Who knows. However they are understood, the crossings seem to mark deliberate movements with starting and finishing points that have become, in most cases, difficult to determine with precision. The following questions then for me become crucial: what constitutes the ground of these crossings exactly? What is it that allows these crossings to be made? There is an uncertainty here about the support (physical and metaphorical) on which they were made. Perhaps the obvious answer would be this: The paintings are made on paper so the crossings effectively take place on the solid ground that is the paper. End of story. But is it? Is the ground not also the table on which they were made? Perhaps, but this needs to be extended. If it is not the table, then it is the floor of the studio in which these paintings were made. No, this can’t be right. It is not just the floor. It is the earth. The earth is the ground on which these crossings were made. Without the earth underneath it all, there would be no crossings, there, on paper. This is a solid and unquestionable foundation. The indisputable ground for all paintings. But, again, is it? When you think about it, the earth is really a concordance of individual experiences. This is what the earth means: an agreement between humans that this is our ground. This is between humans. Fish might not necessarily agree. So I stand here in this gallery and I have the feeling of a solid ground underneath my feet. I can share this feeling with others around me. We all agree. This concordance is then, on first impressions, what appears to be the ground on which these crossings were made. But can a concordance of individual experiences truly constitute a solid ground? On what basis can I draw the conclusion that this earth, this agreement between individuals, is really what allows these crossings on paper? There is a snag here. The problem is that a concordance can vary, not just empirically—my angle is different from your angle, for example—but above all ontologically: the concordance of experiences might not be concordant after all. There might not be a true consistency of experiences to determine that this earth is indeed the solid ground on which these paintings were made. This has nothing to do with whether the earth is flat or round. This is about the shared soundness of the experience of ground. So something else—perhaps something more fundamental—must serve as the ground for these paintings, these crossings. The earth is really a body, a celestial body. This is not an easy thought. It is difficult because a body cannot itself be a ground. The earth indeed floats in the universe. It has no ground. It is itself groundless. So these paintings were made on a ground called earth, but this ground is really a concordance of arbitrary individual experiences that, basically, has no ground properly speaking. What an odd situation: paintings made on a ground that—in itself—is not a ground. Crossings made without real grounding. Art made without proper foundation. If you think about it, this also explains why one does not walk over a body. One can use a body to make paintings or a set of crossings (Yves Klein’s Anthropometries of the Blue Epoch or Peter Greenaway’s Pillow Book spring to mind), but the body remains sacred, not something to be walked on in the way we ungraciously trample the earth. So these crossings know no solid ground, neither as a concordance of experiences nor as a celestial body. Groundlessness oddly seem to be their basis. So what? In this search for something solid on which to imagine these crossings have been made, a much more disturbing thought suddenly becomes obvious to me: being effectively groundless, the earth ultimately neither moves nor remains at any one point at rest. An unacceptable statement, no doubt. The earth moves. We all know this. It goes round and revolves around the sun. It’s all self-evident, proved, and unquestionable since Copernicus. And yet if one closes the eyes and forgets the change of days, nights, and seasons, the earth is really neither in motion nor at rest strictly speaking. Such an unacceptable statement can only really be understood if we prevent ourselves from drawing any measuring relationship with our eyes open or our mind’s eye. In order for there to be either motion or rest, we indeed need measurements (rotations or cycles, for example), but if we ignore all these well-founded and incontrovertible measurements (or take others in consideration, it matters little), then the earth itself neither moves nor is at rest strictly speaking. Motion and rest are really human apperceptions, conceptual reductions that help to articulate the plane on which we build our lives, our history, our future, but they have no real basis in the event of materiality that we are. The earth happens. Yes, it revolves around the sun, but this revolving only makes sense if there is a perspective, a point of view, and a human eye. Without all these, there’s only earth. To make things worse, if I take the earth not as the sum of concordant experiences but as a body, then technically, I am, as this other body, neither moving nor resting either. And the same goes for the painter of these water-colours: however much he has a will determining nearly all of his movements, he was neither in motion nor at rest when he made these paintings. Now this throws a spanner in the works because if he was neither in motion nor rest strictly speaking, then the artist could not have made these crossings. So what are we actually seeing here with these fragile paintings? What are we witnessing here with these sombre and muddied colours (traces of soot? ), these fragmentary and allusive stains, these sober and mucky crossings? Ah! Yes, rest. While constant motion, in a way, makes sense, the idea of rest, stop, start or end-point is not so easy to determine. The problem is indeed that rest—however it is conceived—always implies an absolute. It is from a theoretical absolute stillness that the idea of rest effectively makes sense. Without it, rest makes no sense. But, as we all know, this absolute stillness does not exist as such because it is always already dependent on the idea of a fixed spatial and temporal ground on and from which it can be determined, measured, and even, in some cases, calculated. Rest takes place, now, at this precise spot, for example. Because it is entirely dependent on a measurable spatial and temporal ground, rest is therefore again entirely relative. It is as unreliable as our previous concordant experiences on which we first thought these paintings were made. It is as groundless as the earth understood as a celestial body. There is therefore no starting and end point, nothing truly restful that can acquire a seal of certainty, an assurance for all and everyone. Rest is relative both spatially and temporally. Rest is, therefore, of little use. Overall, I think, the issue here is, perhaps, most simply repetition. It is against repeated artificial rests that these crossings are in fact made. Contrary to what one might expect, these paintings show that it is in fact repetition that needs to be avoided at all costs. This is what these recurrent crossings seem to imply: they are about the journey and not the repetition of relative rest-points. But it is not just the journey that counts. It is the fact that these journeys are open to the unknown, not this or that end-point in particular—this would invite repetition—but the utter unpredictability of the end-point of a brush’s journey on paper. The paintings indeed look as if they emphasize the accidental or the unexpected. A smudge here could have been made accidentally. A mixing of pigments there could have been arrived at inadvertently. We don’t know and yet it is clear that the accidental somehow plays here a part. They show that the artist has an interest in processes that give rise to unforeseen results rather than final outcomes (Arp, Duchamp, and the whole history of process art obviously here spring to mind). Maybe they are simply experiment in seeing what happens—who knows? In any case, these paintings are, for me, expressions of movements open to the unknown. Their aim is really to avoid the terror—or maybe it is the horror—of absolute rest, of this dead-point at which one thinks one starts or ends, again, or repetitively forever. By wanting to escape repetition and artificial points of rest, these paintings effectively want to reflect as much as possible the body who made them, that is, the body as it naturally rebels against any form of final or repetitive punctuality. There is a synthesis here between the body that made these paintings and the paintings themselves. 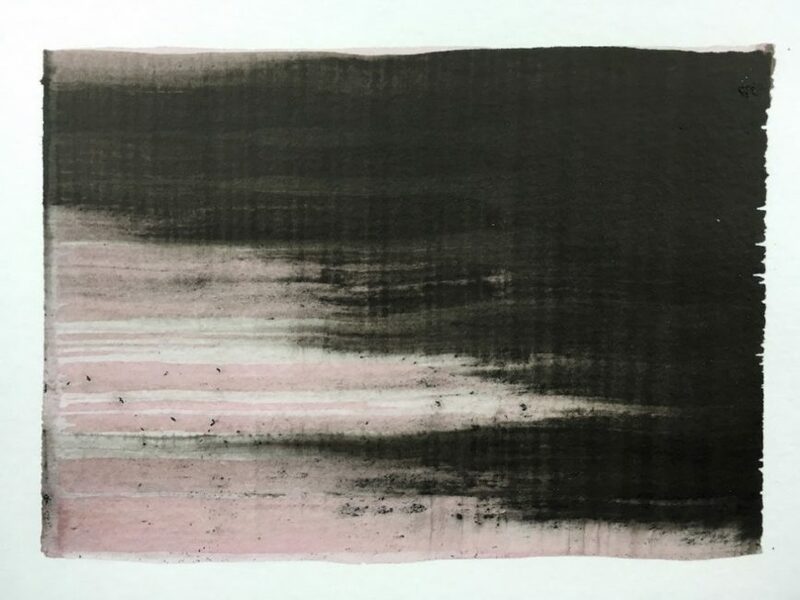 These paintings are not just beautiful marks or stains on paper, they express, like all human beings, an allergy to absolute rest, an aversion to dead-points and repetition. Inevitably, such a desire to evade absolute rest and repetition is also nothing other than a desire to continue a little longer, to open the future, with all its uncertainties, a little while still. As such, they are embodiments to keep the possibility of the possible open, which is nothing else than keeping art and life moving a little further still. So there is no ground and the paintings, like the body that made them, cross over to the unexpected or out into the unknown, fighting stop-points and repetition in a situation in which there is no motion or rest properly speaking. But what is this opening onto a future never future enough that these paintings expose? How is one to make sense of a situation in which nothing is in motion or rest and yet still manages to open itself to the contingent? Perhaps this: In a situation without motion or rest, there can only be a change of setting between foreground and background. The foreground is whatever is perceived as moving and the background is whatever is perceived as rest, even if there’s no such thing as absolute rest. But why this shift of foreground and background? The foreground is often in the driver’s seat. It is the place of will and power. By contrast, the background often stands for rest because it usefully synthetizes the concordance of individual experiences mentioned earlier. For example, I am driving a car and although I know the background also moves (in relation to the sun, for example), it nonetheless passes me by as if at rest. So there are only foregrounds and backgrounds, each touching the other, neither of which giving us a sure footing. It is a game of groundless grounds, bodies shuffling past one another. An unavoidable situation in which nothing registers or fossilizes long enough to establish any form of certainty: that of motion or rest properly speaking. This gives us perhaps our first (more or less) sound answer to our original question about the basis of the paintings’ crossings: They seem to have been made by, neither the brush nor the paper, neither by the body of the artist nor the earth on which he stood, but by the encounter between foreground and background. The paintings cross over and out not because of a determinable origin or end, not because of a firm authorship, but because of a set of shifts in grounds that are, paradoxically, without motion or rest, that is, without conceptual and experiential relatives. And they continue doing so in the gallery. If I move, they move too. If I rest, they continue moving. The same on the page or online (even if the steadiness of the small frame gives another impression). There is never any ground, only shifting foregrounds and backgrounds, with you neither in the middle nor at the start or end. This is one way of making sense of these crossings. This does not relegate the author of these paintings to insignificance. On the contrary, this allows us to perceive the true groundlessness of all crossings, including those made by the earth, the artist, or the viewers. And yet, I can already hear the objection that there is, after all, a “still object”: a painting pined on a wall, immobile, and unchanging. This still object does not mean that foreground and background finally fuse together to reveal a final tradeable product that evades foregrounds and backgrounds. They simply show that here, in this or that painting, foreground and background have touched one another, and this for as long as they remain in their current material form—the grounds might touch otherwise in the future. To make sense of this, it is perhaps necessary to keep in mind the fact that this touching between foreground and background absolutely excludes perspective. The touch between grounds can give no impression of height, width, depth, or position in relation to each other, which are the hallmarks of motion and rest. This touch is most simply bare existence, that is, existence without concordant experiences, artificial or groundless grounds—pure being without any anchoring mechanism or stable viewpoint, angle, or frame of reference, not even earth, this all-too familiar ground. This bareness does not point to an ideal substratum of existence, a kind of empyrean level of reality and it does not expose a primordial substance either. To use a technical vocabulary, this touch is simply the limit-zero of facticity itself, i.e. reality without synthetic apperception, without ground, not even groundlessness itself. Again, this is not something that can be quantified or qualified. This is something that evades all taxonomies and is effectively allergic to language itself—what “is” most simply without motion or rest. So even as still objects, these paintings manage to achieve something unusual with their crossings: expose the touch of foreground and background, pure brute fact, reality exposed as it opens itself to the contingent. And this is where we touch upon (pun intended) what is perhaps, for me, the last crucial characteristic of these paintings: that they were made at night. Night is the sleep of reason; it is the time when the body enters a psychic state that is always impossible to evaluate with graphs or measures. The time that processes—most often irrationally—the rational operations of the day. Night is what gives the slip to the economy and dictatorship of language. Night also expresses a sense of loss, of being in the dark. One never knows where one is, in the dark, at night, especially because one is so often alone. Night works hard to reject all forms of perspectival or synthetic apperceptions. I think the paintings show this quite clearly: open to the contingent, they appear to be made without conscious deliberation. The hand that drags the brush with its water and pigments across the paper knows no apparent reason. The stains, crossings, marks, traces, blobs, scratches all happen without why. As such, they are more about appraising and reacting to a carefully staged but nonetheless contingent set of gestures (the monk’s ritual) than about conscious and rational decision making. This does not mean they are automatic paintings because if they were, they would already put themselves out as intentionally and rationally involving the unconscious. In their simplicity, these crossings, these paintings are, on the contrary, exposures to what defies reason, to what defies even irrationality itself, mere exposures of a passing without why. And what defies reason is precisely this touching intimated earlier between foreground and background, that is, this touching at the limit-zero of facticity itself. This is most simply the painterly revelation of a life rendered bare. A rare feat and a rather comforting thought in our turbulent world, in this world stifled with measures, discordances, false grounds, always postponed endpoints and never ending recurrences.